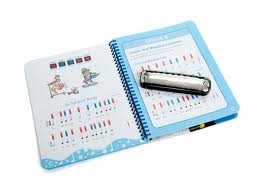 Well designed for young beginners, Learn & Play’s harmonica package comes neatly arranged with its own handy sized instructional booklet and 10 hole harmonica in C Major. 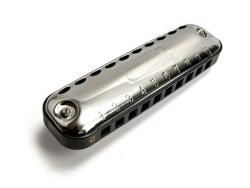 There’s no mistaking the harmonica with it’s shiny alloy cover plates and trademark air outlets. It could almost be mistaken for a 1950s flying saucer. As an entry level instrument the harmonica is responsive enough for beginners to use and beautifully light in the hand. It is reasonably air-tight although we did find it a little bit spongy when we played it. 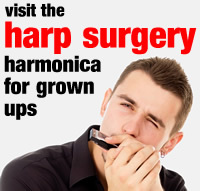 Unlike the wide-spaced beginner harmonicas, the Learn & Play harmonica has standard gauge mouth holes. And that’s not such a bad thing, as it means novices won’t need to adjust their embouchure when they graduate to a performance instrument. The instructional manual is broken down into 8 lessons with a certificate of accomplishment to complete things. Lesson 1 runs through the parts of the harmonica, how to hold it and how to maintain it. lesson 2 gets to grips with note values and breathing. Lesson 3 moves on to chords and chugging, and the booklet’s first of fifteen songs, Are You Sleeping. Lesson 4 covers more chords and three more tunes. Lesson 5 introduces the concept of movement on the harmonica and adds Lullaby and Au Claire De La Lune to the repertoire. Lesson 6 is the last chord chapter and explores the middle octave of the harmonica. Lesson 7 introduces single note playing with five simple melodies. Lesson 8 then draws chords and melodies together for a big finale with Good Night Ladies, When The Saints Go Marching In and Jingle Bells. The journey is fun and educational. 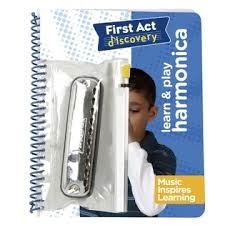 First Act Discovery have combined standard notation and harmonica tab as part of a highly enjoyable learning process. The manual is set out very nicely with some amusing imagery and clear use of graphics and colour coding. You can find your own copy quite easily (and very affordably) on line at Amazon.